It may be "cool"…but its an unislamic practise of another fool! Ø Some said it developed from the celebrations of spring at the equinox on March 21. Ø Some said that this innovation appeared in France in 1564 CE, after the introduction of a new calendar, when a person who had refused to accept the new calendar became the victim of some people who had subjected him to embarrassment and made fun of him, so he became a laughing-stock for others. Ø Some said that this innovation goes back to ancient times and the pagan celebrations connected to a specific date at the beginning of spring, so this is the remnant of pagan rituals. It was said that hunting in some countries was unsuccessful during the first days of the hunt in some countries. This was the origin of these lies which are made up on the first day of April. Ø The Europeans call "April Fool" le poisson d'avril (lit. "April fish"). The reason for this is that the sun moves from the zodiacal house of Pisces to the next house, or because the word poisson, which means fish, is a distortion of the word passion, which means suffering, so it is a symbol of the suffering endured by Jesus (peace be upon him), according to the claims of the Christians, and they claim that this happened in the first week of April. Ø Presently people call this day April Fools' Day, as it is known to the English. That is because of the lies that they tell so that those who hear them might believe them and thus become a victim for those who are making fun of him. 'Aasim ibn 'Abd-Allaah al-Qurawayti wrote that many of us celebrate what is known as April fool or, if it is translated literally, the "trick of April". But how much do we know of the bitter secret behind this day? According to his research Islam was flourishing in Spain and the Christians after careful study concluded that it was because of the taqwa[piety] of the Muslims that Islam was so successful. So they introduced the younger Muslim generation to wine and other intoxicants and made such evils freely and cheaply available. This tactic on the part of the Christians produced results, and the faith of the Muslims began to weaken, especially among the young generation in Spain. The result of that was that the western Catholic Christians subdued the whole of Spain and put an end to the Muslim rule of that land which had lasted for more than eight hundred years. The last stronghold of the Muslims, in Grenada, fell on April 1st, hence they considered this to be the "trick of April." From that year until the present, they celebrate this day and consider the Muslims to be fools. They do not regard only the army at Granada to be fools who were easily deceived, rather they apply that to the entire Muslim Ummah. It is ignorant of us to join in these celebrations, and when we imitate them blindly in implementing this evil idea, this is a kind of blind imitation which confirms the foolishness of some of us in following them. Once we know the reason for this celebration, how can we celebrate our defeat? Let us make a promise to ourselves never to celebrate this day. We have to learn from the Spanish and adhere to the reality of Islam and never allow our faith to be weakened again. 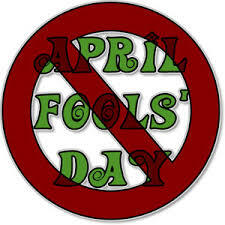 It does not matter what the origins of April fool are. What matters more is knowing the ruling on lying on this day, which we are sure did not exist during the first and best generations of Islam. It did not come from the Muslims, but rather from their enemies. The things that happen on April Fools' Day are many. Some people have been told that their child or spouse or someone who is dear to them has died, and unable to bear this shock, they have died. Some have been told that they are being laid off, or that there has been a fire or an accident in which their family has been killed, so they suffer paralysis or heart attacks, or similar diseases. There are the endless stories and incidents that we hear of, all of which are lies which are forbidden in Islam and unacceptable to common sense or honest chivalry. Abu Umamah Al-Bahili (May Allah be pleased with him) reported: Messenger of Allah (PBUH) said, " I guarantee a home in the middle of Jannah for one who abandons lying even if its just for the sake of fun'' [Abu Dawud]. It was narrated by Mu'aawiyah ibn Haydah[ra] that he heard the Prophet (pbuh) say: 'Woe to the one who talks to make the people laugh and tells lies, woe to him, woe to him." (narrated by al-Tirmidhi, 235. He said: this is a hasan hadeeth. Also narrated by Abu Dawood, 4990). When our Muslim Ummah is being disgraced and humiliated by the Kuffaar from East to West, how is it possible for a believer with even a minute degree of Imaan[faith] to engage in this evil custom of April Fool's Day! According to Wkipedia.org -Water is a ubiquitous chemical substance that is composed of hydrogen and oxygen and is vital for all known forms of life. 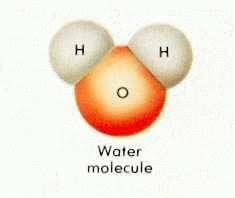 Only after advances have been made in science, do we now know that cytoplasm, the basic substance of the cell is made up of 80% water. Modern research has also revealed that most organisms consist of 50% to 90% water and that every living entity requires water for its existence. 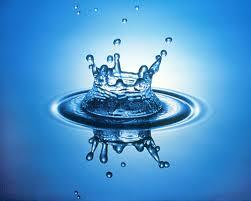 Was it possible 14 centuries ago for any human-being to guess that every living being was made of water? Moreover would such a guess be conceivable by a human being in the deserts of Arabia where there has always been scarcity of water? Why is Cleanliness a Virtue? Can such a concept really be a virtue? Yes. While the standard of cleanliness may vary from time period to time period, and from culture to culture, meeting the standard of your time and place is not without merit. Cleanliness makes your feel good. Regardless of whether the feeling is inherent, or created by social conditioning, keeping your body, clothes, and home clean feels undeniably great. A hot shower, your favourite clean outfit, and a well organized house make you feel ready to take on the world. 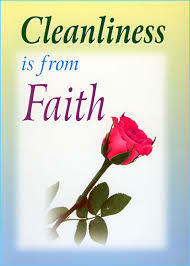 Cleanliness keeps your mind clear and your life organized. If your house is a total disaster, your thinking is going to feel similarly disorganized. There is an natural connection between the order of your environment and the state of your mind. Clutter will weigh you down and stress you out. A clean, well-organized environment will lift your spirits. Cleanliness gives you a good image. How you present yourself in life is paramount. If you, your clothes, or your house looks like a disheveled mess, people are inevitably going to judge part of your character and personality on such evidence. Perhaps that is unfair, but it is how the world works. When you present a neat and clean appearance to others, they will respect and think highly of you. Cleanliness leads to beauty. That which is neat, well-proportioned, and symmetrical creates beauty and appeals to the eye. As we transform our lives to be orderly and clean, we increase the amount of beauty in our lives.The Messenger of Allah[peace be upon him] said: "Allah, Most High, is beautiful and likes beauty." Cleanliness leads you closer to Allah. Ablution is a pre-requisite for salaah[prayer].When a person stands in salaah[prayer] all the veils between him and Allah are lifted and the person then communicates directly with Allah. Without being clean [making wudhu(ablution)] the person cannot stand in Salaah! 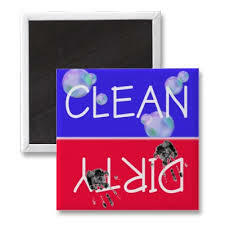 Cleanliness is next to Godliness!!! MANY people forget or neglect the importance of time although man's life on earth is a span of time. Islam gives due attention to the issue of time because if people waste their time, they are actually wasting their life. The Holy Qur'an gives due attention to the idea of time and this is clear in many verses of the Qur'an when Allah swears using the different places of times of the day to reveal the importance of time, "By the break of Day," (Qur'an, 1:89) "By (the Token of) Time (through the ages),' (Qur'an, 1:103) .etc. Prophet Muhammad (peace be upon him) says in one Hadith: "There are two things that people are not aware of how important they are: health and time." This Hadith stresses two facts: People are not aware of the importance of being in good health till they fall ill and people are not aware of the importance of time and therefore waste their time doing trivial things. Karen Armstrong, refers to this aspect of time in Prophet Muhammad's (peace be upon him) life. She indicated that what the Prophet (peace be upon him) did in 23 years was miraculous and what he accomplished required thousands of philosophers, reformers, intellectuals and mentors to do in hundreds of years. To realize the value of ONE YEAR, ask a student who has failed a grade. To realize the value of ONE MONTH, ask a mother who has given birth to a pre-mature baby. To realize the value of ONE DAY, ask a daily wage labourer who has kids to feed. To realize the value of ONE MINUTE, ask a person who has missed the train. To realize the value of ONE SECOND, ask a person who has avoided an accident. To realize the value of ONE MILLI-SECOND, ask the person who has won a silver medal in the Olympics. 2. 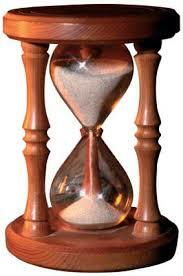 Time that passes can never return, nor can it be compensated for, for time is irretrievable. 3. Time is the most precious thing that man possesses. One of the methods of managing his time properly is for a Muslim to get up early and sleep early, for early hours always yield great blessings. Starting his day with prayer and the supplication of the morning brings the Muslim Allah's grace. A Muslim should always bear in mind that every time has its own task that suits it. Doing tasks in their due times brings about peace of mind and comfort. The most important aspect being gaining such knowledge of Islam that will enable and empower one to do such actions at a given time that pleases Allah abundantly! A Muslim is disciplined and uses every second constructively and productively! in your own "liberation" rejoice. You're so thankful that you're free. You're the weak and I'm the strong. For I've rejected the trap of man. those are devices for pain and hurt. I'm not falling for that little plan. I'm a person with ideas and thought. I'm not for sale, I can't be bought. nor be promoted for my charm. There is more to be than playing coy. and still bring home a wage. Who thought up this modern "freedom"? Where man can love'em and man can leave'em. This is not free, but life in a cage. "hormones" they laugh "what a shame"
your job they can always fill. No promotion unless you're sterilised. No promotion unless you're sexually terrorised. Non-Muslim woman you can have your life. Mine - it has less strife. and I hope you see this very soon. For your own sake - wake up and use your sight. Are you so sure that you are right? He smiled at a sorrowful stranger. The smile seemed to make him feel better. And wrote him a thank you letter. That he left a large tip after lunch. Gave part to a man on the street. For two days he'd had nothing to eat. He left for his small dingy room. that he might be facing his doom. And took him home to get warm. To be in out of the storm. That night the house caught on fire. The puppy barked the alarm. And saved everybody from harm. Grew up to be Upright President. That hadn't cost a cent. 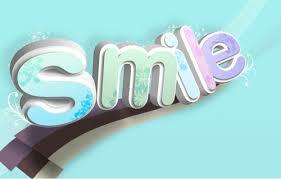 Be part of Operation Smile...its Highly contagious!!! Vitamin D...Are You Getting Enough? As a Muslim woman who wears the niqaab (face-veil, headscarf, and jilbab), and after much research on the subject, I wish to increase awareness amongst sisters to take precaution in preventing vitamin-D deficiency. We may be at a slightly higher risk than others due to the lack of sun exposure because of the way we dress and due to the fact that many of us may rarely leave our homes. People who are mostly susceptible are those who stay indoors most of the time, wear sunscreen constantly, who are vegetarians who cut out all forms of meat including fish...etc, or live in a location that lacks sufficient sunlight sometimes up to 6 months during the winter months. Vitamin D keeps our bones strong, helps to prevent some cancers and benefits the immune system. Preliminary research suggests it may reduce the risks of breast, prostate and colon cancer. This vitamin is a hormone and is manufactured in the body. It helps the body utilize calcium and phosphorous and builds bones and teeth. Your body can only make vitamin D under the proper conditions. It actually does not take much to do so and will not compromise our lifestyles. It is recommended that you try to find a secluded place outdoors so that you can expose your face and hands to direct sunlight for 10 to 15 minutes only 2 or 3 times a week. (Remember too much sun is not good either and overexposure can lead to skin cancer). You will most likely manufacture enough Vitamin D to meet your needs and because it is a fat-soluble vitamin, you can store enough to supply you for days even months without sun exposure (according to many health specialists and Bill Sardi a health journalist and consumer advocate in CA). Rickets and Osteomalacia (adult form of rickets) is also caused by a lack of vitamin D in the body. This is when the bones become increasingly soft making them brittle and more flexible causing deformity to the body. Symptoms can include pain in the limbs, spine, throat, and pelvis also amenia and progressive weakness. Vitamin D is formed in the skin by the action of short-wave ultra-violet light. Precursors of vitamin D in the skin are converted into cholecalciferol, a weak form of vitamin D3, which is then transported to the liver and kidneys where enzymes convert it to 1,25 dihydroxycholecalciferol, the more potent form of vitamin D3. Vitamin D precursors require cholesterol for conversion into the hormone-vitamin. Without adequate sun exposure, vitamin D precursors turn to cholesterol instead of the vitamin. 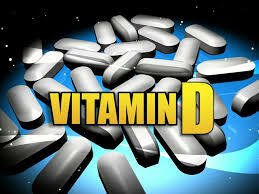 Fat-soluble vitamin D supplements are available. Vitamin D3 is believed to exhibit the most potent cancer-inhibiting properties and is the preferred form of the vitamin. Evidence of vitamin D's protective effect against cancer is compelling and it may also go beyond cancer prevention and provide tumour therapy. Much has been made of pharmaceutical angiogenesis inhibitors- agents that help inhibit the growth of new, undesirable blood vessels that tumours require for nutrient supply and growth. Laboratory tests have shown vitamin D to be a potent angiogenesis inhibitor. Vitamin D also works at another stage of cancer development. Tumour cells are young, immortal cells that never grow up, mature and die off. Because vitamin D derivatives have been shown to promote normal cell growth and maturation, drug companies are attempting to engineer patentable forms of vitamin D for anti-cancer therapy. So my dear sisters, it does not require a whole lot to avoid vitamin-D deficiency. Only a small amount of sunlight and/or vitamin D supplements are required. If you do not have the convenience of you own privacy fenced-in yard, try to find a secluded place to expose only your face and hands for about 15 minutes such as a park for example, where no one else can see you. Choose the least busiest time to go. You do not have to compromise the wearing of niqaab in doing so sisters. Remember, even sisters who do not wear niqaab who live in locations such as Canada, Alaska, etc where you lose much sunlight or even work indoors most of the day should take these extra precautions in order that we may all help to keep our bodies healthy. ...and Allah knows best as Allah is indeed the Most Wise and the Most Merciful!!! Praying at home or the masjid, and then sneaking out to party at a nightclub. Wearing hijaab around family, and then turning into a fashion diva at school.One person, two worlds, and a desperate struggle to juggle them both. This is the reality which many Muslim youth in the West are living in. We can call them "cultural chameleons," or describe them as having "split personalities." Whatever the label, the situation is the same… with often tragic consequences. We are not just referring to your community brother or sister's devastating death, but rather we refer to the many grievous examples of teens running away from home, getting into drugs, and much more -the worst of which is turning away totally from Islam, rejecting it completely. We are not exaggerating. It's a reality, and those who deny it are either willfully blind or pitifully naive. It is time that we addressed the situation seriously. First there must be awareness of the reality and knowledge of its causes. The next step is to know what to do when faced with it directly (hint: it does NOT involve killing anyone). And finally, we need to know how to nip the problem in the bud - an ounce of prevention is better than a pound of cure. Although each situation is different, there is a general list of what can cause this worst nightmare of any Muslim parent. Lack of strong Islamic foundation in the home. As with most things, it begins in your own backyard. If you aren't raising your children as Muslims with a strong understanding of what it means to be a Muslim, then you can't expect them to be happy about having to follow strict rules all the time. It's also important to note the difference between Islam and culture. If you don't pray five times a day, or encourage your kids to pray, yet freak out if a female family member walks out with her head uncovered, then you really need to straighten out your priorities. Double standards. Related to the first point, here we're talking about when parents are setting a double standard for themselves and their children: in public they seek to ingratiate themselves within Western society, to achieve the Western societies dream of big house, fancy car, and being best friends with the Joneses next door; yet at home they are obsessed with their children following cultural practices that aren't even necessarily Islamic. It should be no surprise, then, when the children follow in their parents' footsteps and start living a double life themselves. Lack of personal understanding/ conviction of Islam. This is another major factor in youth straying from Islam. Again related to the first point - if you don't have a strong Islamic foundation in the home, then there will be most likely a lack of understanding of what exactly it means to be a Muslim. If you don't know the reason behind something, how likely are you to do something if you view it as restrictive and interfering? If you tell your children to pray because if they don't they'll burn in Hell, then trust me, they won't be doing it out of love for Allah - they'll be doing it out fear… and not even fear of Allah, but fear of you. Similarly, if you tell a girl she has to wear hijaab because otherwise she'll "stain the family's honour" or some-such rubbish like that, then once she's exposed to the Western mentality of freedom (and total lack of anything resembling honour) she won't give two hoots about the hijaab or your notions of honour. On the other hand, if your child has a personal relationship with Allah and knows exactly why we do some things and stay away from others, they will be far more willing to tough it out and continue to obey Allah. General teen rebellion. Sometimes, teens can just be idiots. Common sense is a rare thing amongst youth these days, and it shows… sadly, some take it too far - beyond the streaked hair and pierced bellybutton (hey, as long as it's covered up by hijaab, be cool with it!) - and make some really bad choices. The Messenger of Allah[pbuh] said: "Youth is a kind of madness"[Hadith].Being intoxicated by the passions of youth we never ponder for a moment that we shall we questioned by Allah. Insecurity. This is something which affects people everywhere, regardless of their race, religion, or even age. The desire to want to "fit in" and become an accepted member of the crowd is human nature - sometimes it can be a good thing; other times it can be so harmful and detrimental. For girls, the issue is often about body image and beauty, which is why hijaab becomes such a struggle. For guys, it can be about proving their "manliness" (by pursuing other girls, or getting involved in 'tough guy' activities like drinking alcohol, drugs etc.). Build your child's self-esteem at home and let them know that they don't need to seek approval from anyone except Allah. Compliment your children, praise them, let them be confident in their faith and in themselves. Tell your son that he's cool. Tell your daughter that she's beautiful. Don't demean them or belittle them; honour them as the Prophet (sallallaahu 'alaihi wa sallam) honoured his daughter Fatimah (radhiAllahu 'anha) by giving her his sitting place. How do you know if your child, your sibling, or your friend is a "cultural chameleon"? It can be difficult to spot it, but however much a kid can try to sneak around, those closest to them can usually figure out what's going on. Here are some of the symptoms of the double-life syndrome. Shows dislike of Islamic practices ("Yuck, hijaab is so old-fashioned," "What's the point of praying? It's stupid!" etc.) This is particularly obvious in a household that is generally religious, or has more than just a tentative connection to the Deen. Secretive, sneaky. It's important for parents to keep an eye on their kids and know where they are and what they're doing. If you notice that your child is being secretive, sneaky, and generally deceptive about their activities, then it's a major red flag that your son or daughter isn't doing the right thing. This goes for pretty much all families, Muslim and non-Muslim alike, but for us Muslims it means more than just that your kid is with bad company or doing bad things: it means that they're losing their connection to Allah and to Islam, and this in itself is far worse than whatever sinful activities they're engaged in. An ounce of prevention is worth more than a pound of cure. Educate your child from a young age, build a strong (but loving) Islamic environment within the home. Make them aware of their identity as Muslims, emphasize pride in their Muslim identity. However, we can't say that prevention is the only thing that we can do - the reality is that even children who were raised in a strong Islamic environment can be "lost" in the Dunya… and this is the reality we have to deal with, not deny. Having said that, here are some practical solutions on dealing with such situations. Do not react angrily or violently. If you find out your kid is lying to you and is leading a double life, do NOT freak out at them, scream at them, hit them, etc. 3) not be productive in any way, shape, or form. Take some time to cool off after you find out. Pray a naafilah (voluntary salaah), and make lots of dua i.e. ask Allah to grant you the patience and strength to deal with the situation. Talk to them. Ask them what has led them to do the things they've done, what their state of belief is (cases differ drastically: some teens still have emaan and are just confused; others go to the point where they deny Islam completely), and how they feel about their situation in general. Try not to judge them; the key is to listen to them and know where they're coming from. This will give you information on how to best approach them when the time comes to try and "fix" things. Serious counselling may be needed. If you feel as though you are unable to deal with the situation correctly yourself, contact a trustworthy, knowledgeable, and understanding Imam,Moulana or Shaykh in your area (or use the Muslim Youth Helpline). It's best to have someone involved who not only knows the Islamic perspective of things, but can also relate to and understand your child. There must be someone whom your child can feel comfortable enough to work with/ talk to if they don't feel they can open up to you (the parents). In this stage, there has to be a lot of give-and-take, questions-and-answers. If you already had a long talk with your child previously and asked them all those questions, then now is the time to bring forth your feelings. If you haven't had the talk, then now is the time to initiate it. Counselling is a long and sometimes painful process, and only one step forward towards healing. One cannot expect things to change overnight, and it will be very difficult - all I can say is, trust in Allah and look to the Sunnah for help. Have emaan, taqwa, and lots of patience and forbearance. Constantly turn to Allah in du'a, especially the last third of the night. Indeed, this is something that should be done at all times… it is a means of prevention, as well as part of the path to the cure.